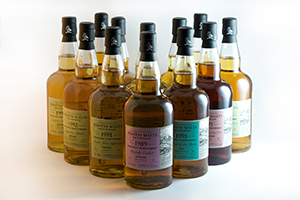 October 14, 2013 – Wemyss Malts is releasing 12 single cask malts for the holidays in the company’s largest release yet. The whiskies come from all five of the major Scotch whisky regions, and were selected by the Wemyss tasting panel under the guidance of veteran whisky writer and consultant Charles MacLean. The company names its whisky releases according to the taste profile of each cask, and each whisky will be available in the U.K., Europe, and selected Asian markets. Recommended pricing for each expression will be between £60 and £105 ($95-170 USD).